Getting ready to sell a house is more of an art than a science. Before your house goes on the market, you want to make it look as up to date and desirable as possible, but you also want to be wary of putting too much time and money into improving a space you won’t be living in much longer. Trying to figure out where to spend and what projects to skip can be especially difficult, as different features can offer vastly different returns on your investment. Having updated bathrooms is especially important, and can even make or break the sale of your home, but it’s important to choose your projects wisely to get the best results for every dollar spent. 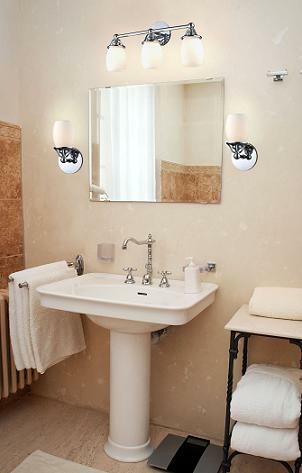 One of the absolute best ways to improve the appearance of your bathroom is to upgrade your bathroom lighting. This is true of almost any bathroom – though the darker your space is to start, the bigger the difference will be. Bright spaces always look larger and cleaner than dark ones, so even swapping bulbs to a higher wattage can make a difference. Replacing an old fixture with a new one (especially one with more or brighter bulbs) is a relatively DIY friendly project that shouldn’t cost you more than a hundred dollars, but will make a huge difference in the overall appeal of your bathroom. Adding a second lighting fixture – especially sconces on either side of your mirror for task lighting, or an over-mirror light where there isn’t one – can be a little bit more expensive, but will recoup most of the investment and significantly improve the look and feel of your bathroom. 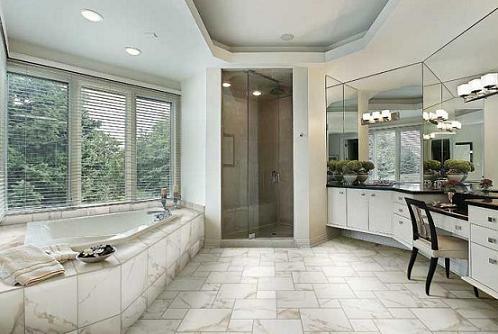 Whether or not to update your flooring depends largely on the type and condition of your current bathroom floor. If you’ve got some decent-looking but slightly aged ceramic tile, it probably isn’t worth the cost of ripping it all out and replacing it. But if you have old, stained, or visibly damaged vinyl or linoleum (or worse, carpet), replacing it even with a budget flooring can vastly improve the desirability of the space. These types of flooring are also easier to remove, which helps reduce the overall cost of the project. Installing vinyl, linoleum, or even laminate is inexpensive and DIY friendly way to update a really bad floor on a budget. Porcelain – especially luxury stone or wood print tile, while more expensive, will add more to the overall value of your home. 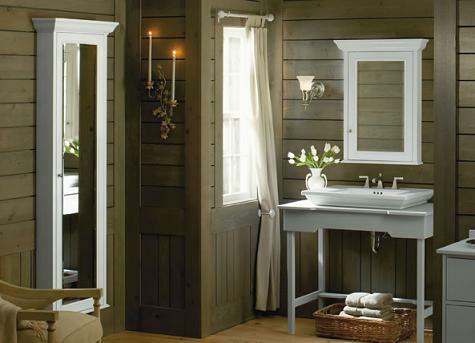 Surprisingly, swapping out your bathroom vanity – if you do it right – is one of the absolute best improvements you can make in a bathroom. 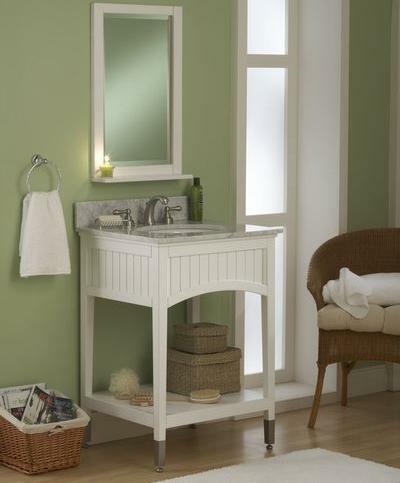 Now, again, if you have a decent vanity in good structural and visual condition, it probably isn’t worth replacing. But if the one you have is old, worn, or obviously outdated (read: made of golden oak, or with a pastel sink or vanity top), simply replacing it can completely transform the appearance of your bathroom. Bathroom vanity combos that come with sleek granite or marble counter tops (or even with the sink and faucet included) are surprisingly affordable, and offer such a thorough update that you can expect a 100% return on your investment. Built in storage has become a hugely desirable feature, both in bathrooms and in kitchens, and adding more storage to your bathroom is a great way to add value to your home. Even simple shelves can make your bathroom more desirable, but if you have the time and budget to splurge on installing recessed cabinets, or adding utility to existing cabinets (like pull out shelves or drawer organizers), it’s absolutely worth the cost. These features will appeal to practically every buyer, and even more expensive options offer a full return on your investment. If your bathroom is in overall good condition, it still can’t hurt to give it a bit of a facelift. If your walls aren’t tiled or otherwise finished, a fresh coat of paint in a light color can do wonders for the space. If you’re still living in the house while it’s on the market, you won’t be able to keep everything 100% neat 100% of the time, but do your best to pack away as many personal items as possible. Buy new, nice looking towels and a matching shower curtain, and coordinating accessories like decorative shower rings and a matching soap dish and toothbrush holder. Swapping out your hardware on your bathroom vanity, your shower head and tub spout, toilet paper holder, and towel bars are all small, inexpensive ways to boost the appearance of your bathroom without making any big changes. Likely none of these projects will have an impact on your home’s resale value, but it might make a prospective buyer more likely to say yes, which is easily worth a little time and effort. How have you been prepping your home for sale? Are there any particular improvements you’ve made that I haven’t mentioned here? Let me know in the comments! This entry was posted in Bathroom, Bathroom Lighting, Bathroom Vanities, Decorating Ideas and Tips and tagged Bathroom, bathroom accessories, bathroom design, bathroom flooring, Bathroom Lighting, Bathroom Storage, bathroom updates, Bathroom Vanities.